Me again. I wanted to take a minute to introduce a piece of freeware I’ve started using to help plot out my stories. It’s called Freemind (http://freemind.sourceforge.net/wiki/index.php/Main_Page) and it’s mind-mapping software. I know. It sounds like something a psychiatrist would recommend, and while there are those who are nodding their heads, silently saying “Yep. I knew it. He’s a basket-case” — it’s not like that. It’s just software to help you brainstorm, and then organize those thoughts into something coherent. Don’t believe me? Here’s an example. Obviously, I’m not going to use my own story so I don’t give anything away to people waiting for the next book, so let’s fall back on the popular example: Shakespeare. 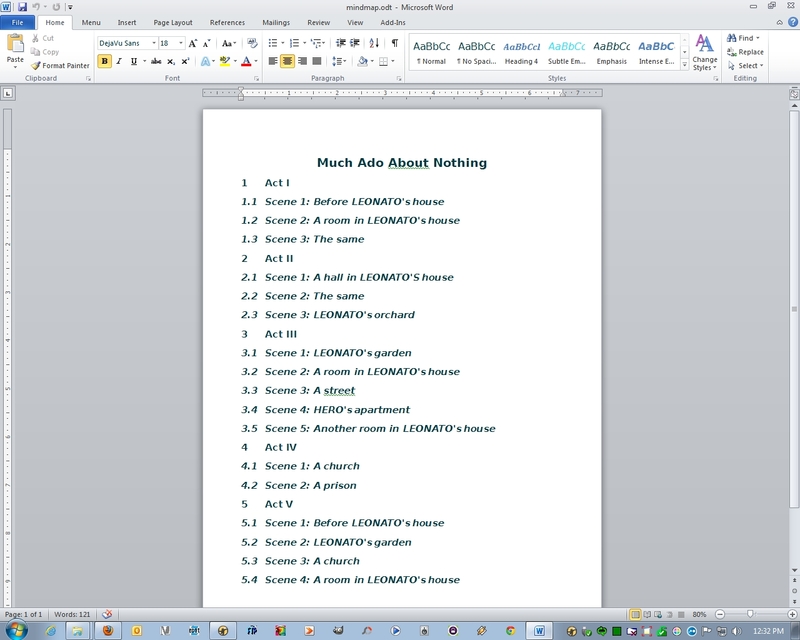 And for chuckles, I’ll use one of my favorite plays, Much Ado About Nothing. Just for the purposes of illustration, we’ll focus on the settings of each Act and Scene, rather than the storyline, since that’s a bit time consuming. 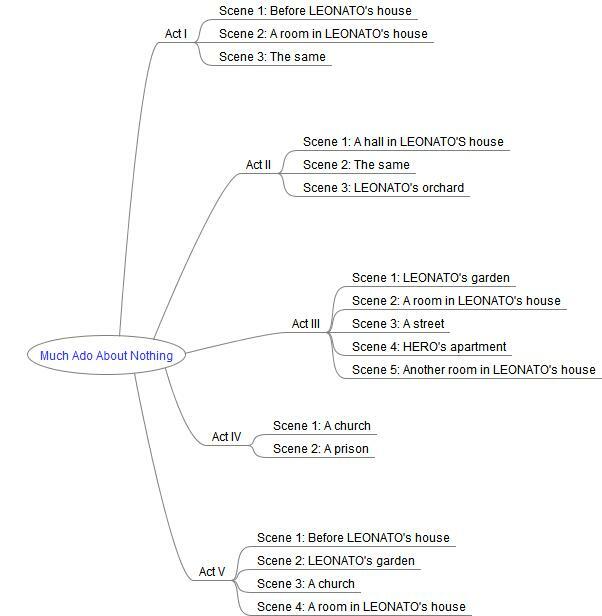 In Freemind, you simply create a new Mindmap, and then name the “New Mindmap” icon for your main idea/story title. Add a “Child Node” for the first scene/act by pressing the INSERT key and name that. While the “Child Node” is highlighted, pressing INSERT again adds a “Sibling Node” for the first item of action (or in this case, the location of Scene 1). Continue this until you’ve gotten all of your ideas out. You can drag ideas from one node to another or rearrange them within the story structure. Once you’re completely happy with it, you can save it as an image, HTML file, or — this is my favorite part — you can export it as an Open Office Document. That’s right. It’s an OUTLINE. You can copy and paste that outline into Scrivener and then use it to write your story. This software is totally awesome, totally free, and I highly recommend you give it a try. New year, new blog entry titles. The Beatles may still crop up from time to time, but today this one popped into my head. Cue the Elvis Costello music. I’ve been spending the past couple of weeks going through every story (published and unpublished) set in Newtonberg and making note of every person, place, organization, or event mentioned. I’ve had to work through some contradictions between one story and another, and I even discovered a glaring error in one of the stories that has already been published, prompting yet another revision. Still, I think it has all been worth it. I just wanted to take a minute to tell you about the program I’ve been using to do this: Scrivener, from Literature & Latte. So far, this program is well worth the cost. It is available for both Windows ($40) and Mac OS X ($45). Education licenses are $5 less if you’re a student or educator. After setting up a project, you can add character sketches or settings sketches. It was easy to create an additional section for other things, such as for events and organizations. In my case, I have sketches for the local churches, boy scout troops, etc., and which characters are associated with each one. One of the best parts is that you can copy these characters/settings/etc. between projects, so when I start the next batch of stories they will already be there for me to reference and add to. And since I finished going through the last story last weekend, I think I’m just about ready to do that. Just about the only thing this program didn’t do for me was make a map of the town, but I’m working on that. Once that’s complete, I’ll be ready to start writing again, and I will be able to tell you about my experience with using Scrivener to actually write the next book.